Discussion in 'Guitars in General' started by mojocaster.com, Apr 27, 2016.
what's your dream guitar? What have you never owned but always lusted after? sixstringfuel and RYAN1987M like this. Martin D35 (I've got the electric covered). lifeson1, Fatboy666 and mojocaster.com like this. I have the things I want except for a McPherson Acoustic. great-case.com and mojocaster.com like this. Yeah, the Ms are great as well! I had a friend that loaned me his D35 for a few gigs, and it is the only guitar that I have consistently wanted for going on 10 years now. 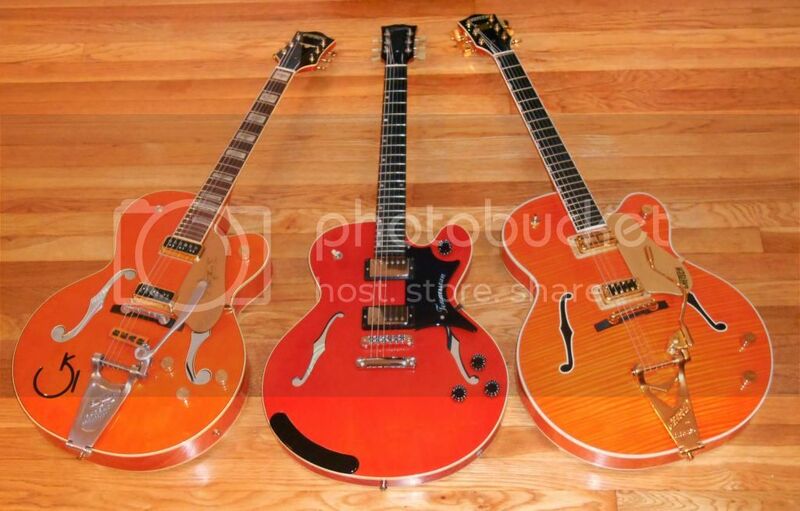 I dig the Gretsch choice...I've always liked the Silver Jets as well. I'd really dig a '68 Les Paul Custom, among others. Although I'd love a good Tele (again) and a classic PRS of some kind. Acoustic- pre war Martin D28. 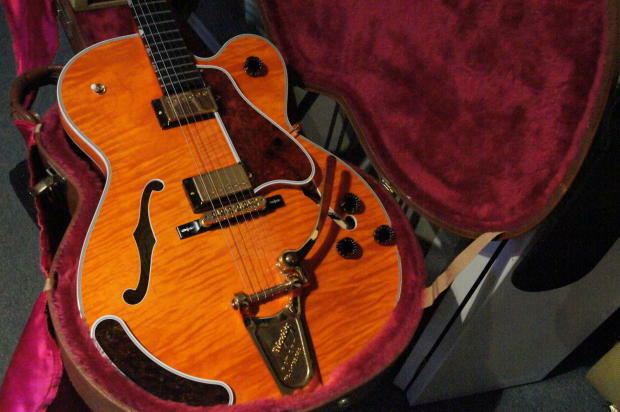 Electric- early Gibson ES 175.
ibis and mojocaster.com like this. thelatrobe33, mr_cheef, Zappatalist and 1 other person like this. I've owned most of my dream guitars, and I've learned (my wife would say too slowly) that there is no such thing as the perfect do it all guitar for me. I've also learned what works for me. As much as I love Gibsonesque designs and used to dream aout them, a strat or a tele is home base to me. So, most og my dream guitars arent dream guitars any more, simply because I've already owned them and know what I can or cannot do with them. I'm considering putting a set of firebird pickups in a strat to fix my St Vincent and Chandler 555 GAS, but that's about it for guitar GAS. lifeson1 and mojocaster.com like this. thelatrobe33, mojocaster.com and pepedede like this. Yeah it is, Josh Homme has been playing it live with iggy pop. 3 pickup LP Custom, but with P90's. Hell, while I'm dreaming, with a stop tailpiece, no ABR, just a stop tailpiece. enharmonic, lespaulreedsmith, e??? and 5 others like this. It's taken me 15 years but I've acquired my 3 top "dream guitars". Ed Alvarado, sixstringfuel and mojocaster.com like this.